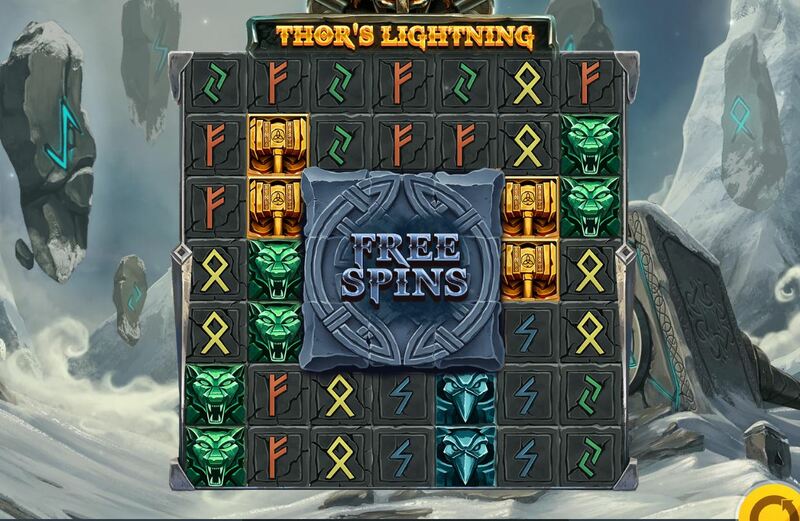 Thor's Lightning slot comes hot on the heels of Red Tiger's numerous other grid-based games they've released of late, Jack In A pot, Tiki Fruits and Gemtastic to name but three. Naturally we have the Norse theme in play here with the grid laid over a background of stone runes and mountains with dramatic music interspersed with some mighty roars and crashes when any action occurs. The background scene sometimes changes between winter day and night too to add effect to the scene, but will it be light or eternal darkness for our bankroll? 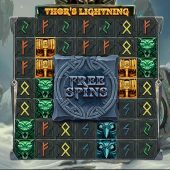 There is a cascade mechanic in play on Thor's Lightning slot with individual tiles on a 7x7 grid. Wins are paid for any cluster of 5 or more tiles adjacent, in other words not joined diagonally. Once the wins have been counted, more tiles cascade down in a mighty crash from above and so-on until it stops creating winning clusters. There is no increasing multiplier or anything but like Play'n Go's classic Viking Runecraft, the Gods may intervene on your behalf with game modifiers. Before we find out what Thor can do, we can get an idea of the volatility and potential from the cluster pays. Now because they are listed as anything from 5 to 40+ in a block, I'll just demonstrate the highest and lowest which are 500x bet down to 1x bet for 40 down to 5 of the Gold Hammer and 10x bet down to 0.1x bet for the lowest stone Rune symbol. There are now Wilds or scatters but you may have noticed a giant 3x3 Free Games Rune permanently in the centre of the grid. It's best we see now how Thor can help us reveal this! Thor may crash down onto the grid in a spectacular display of thunder and lightning and smash his hammer down, very much like he does in the Wildstorm feature in Microgaming's Thunderstruck 2, but only here with much more drama and colour! The lightning may either remove some symbols to allow better ones to cascade down or select one symbol to transform into a Wild wherever it appears. If you don't see the lightning, Thor will throw his hammer onto the grid instead which either removes symbols or nudges reels and rows, in both cases creating a win. Muspell Spins - 5+ free spins where the runes are removed and only the highest 4 symbols are present. There is a Lava random feature which may occur, this can destroy a symbol on the grid, or add symbols where they're needed including Wilds. Valhalla Spins - 4+ free spins where only Gold Shields and blanks are on the reels. All Gold shields are held until the spins end, and will all reveal various cash prizes. Thor's Lightning slot has, without doubt, some of the most scintillating graphics, sounds and animations of all the Norse-themed games I've seen. There is the potential for what I'd call medium range big wins and Thor appears very frequently in the base game with his modifiers. The RTP is decent too at 96.08% but the game has one major flaw in my opinion; the centre 3x3 Rune is simply too frustrating and irritating to observe for any length of time, knowing that when most tiles are removed that the remaining possibilities on the grid are not going to help you remove them and trigger the bonus. Surely it would have been a better idea to have the thing hidden below the grid and have highlight tiles showing through the ones on the grid where they were revealed?